Are you wondering as to how you crack NEET PG? What are those easy tips to crack NEET PG. Obviously that’s what brings you here! Every student aspiring to appear the NEET PG entrance exam is surrounded around by many advisors who are eager to load you with tips to crack NEET PG in the first attempt. Many would guide you saying that you should know the syllabus well, the examination pattern and refer a lot of books etc. Some of them would also tell you to emphasize and make a time-table and focus on your weaker topics to crack NEET PG in the first attempt. But my question is if that’s enough to crack NEET PG? Many of you would have read the prescribed NEET PG books many a time and learned everything by heart. Every page of the book was mugged up! With this approach; how many of you have been able to crack NEET PG with a top rank in the past attempts? The secret to success in NEET PG lies beyond all that routine and standard tips. The biggest secret is to prepare for NEET PG in the manner in which you have to be evaluated in the entrance exam and for this you need to understand the objective of the exam. There is competition also hence draw your strategy to crack NEET PG accordingly. So, the first tip to crack NEET PG in the first attempt is that you should draw up a well-crafted strategy, after a careful consideration of every factor of your weakness and strength. What should your NEET PG strategy entail? How your competitors are preparing for NEET PG? Are you preparing the same way as your competitors are preparing or differently? How would my existing method of preparation help me crack NEET PG? You can only mug up the topics for success in school boards but not in NEET PG. You need in-depth knowledge of the concepts and ability to think and apply such concept and understanding in a meaningful manner. Practice is the key to success to crack NEET PG in the first attempt. Practice gives you the ability to attain perfection and so is true with cracking NEET PG also. With practice, the knowledge level increases, the test-taking ability improves and on top of that your confidence also improves. You would be walking in to the examination hall with the greatest confidence. You need to identify a good question bank for NEET PG. The question bank should contain questions covering the entire NEET PG syllabus. You should avoid a question bank which has repetitive questions or the same concept but having different language pattern. Identifying a good question bank is an uphill task. 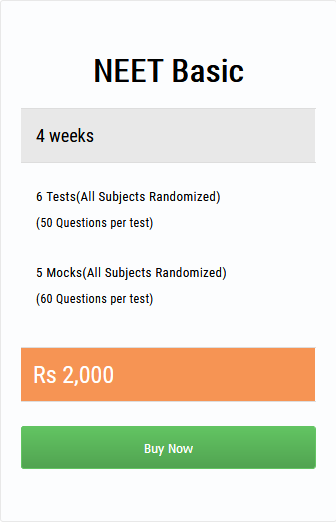 The best of the best coaching institutes would not have the right question bank, which you can practice in a limited time, hence it’s better to practice the NEET PG test series from the online portal which provides an option for both online and offline examinations.